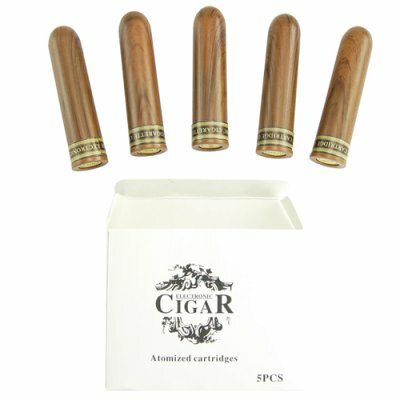 Successfully Added Refill Pack with 5 Cartridges for - CVJV-H17 007 eCigar to your Shopping Cart. 007 eCigar refill pack with 5 regular flavor refill cartridges for this popular fun and cool nicotine replacement technology (refill cartridges for the CVJV-H17 eCigars). Regular cigars are not very practical to use when in restaurants, bars and other public venues. This is a solution to finally be comfortable without having to inconvenience others around you. The refill package contains 5 refills of which each cartridge allows for an average of 300 puffs. The cartridges are completely safe and simple to use. Th refill pack contains 5 cartridges. Each refill cartridge has different level of nicotine density*. A perfect product for our partners who are ready to offer their customers a healthy high-tech smoking alternative, or anyone who needs to source additional cartridges for their existing eCigars. We are offering these nicotine refills at a quantity of at least 5 packs in order to give you the absolute best advantage from our low wholesale price and even better shipping rates. With a required order of 5 refill packs the total number of refill cartridges would be 25 (5 cartridges x 5 packs = 25 cartridges total). Will the artificial smoke affect others around me?